There are many ways to find a school in your area or in a location with desirable sailing conditions – industry directories, sailing magazines and e-magazines, online directories, and boat shows, just to name a few. When you are choosing between the best sailing schools in the world, there are several questions you should ask to make sure you get the best instruction possible. Most of all you want a company that has a stellar reputation, employees that love their job, and a legacy that says they’re always there for you. 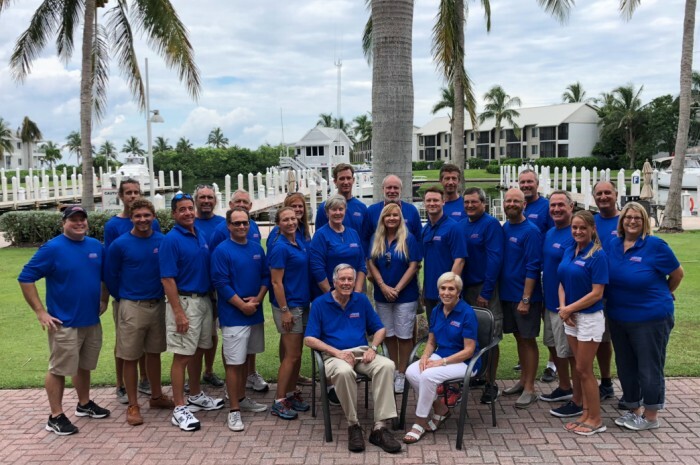 This photo was taken at Offshore Sailing School’s annual Offshore U retreat in September 2018, with founders Steve and Doris Colgate and nearly all of its instructors and headquarters team present..
Certified instructors – Your sailing instructor can make or break your experience. Make sure the instructors at your sailing school of choice hold certifications from notable associations such as US Sailing or the Royal Yachting Association, governing bodies of sailing in their respective countries. Offshore Sailing School is a US Sailing certified school. A mix of classroom and hands-on instruction – You can’t learn how to sail if you never get on the water, but you also need time on land to review concepts and ask detailed questions. A good sailing school will have a well-rounded approach to teaching which includes audio, visual and kinesthetic teaching methods. Proper school certifications – Just like a good instructor, a good sailing school will be accredited by industry associations and adhere at least to the minimum standards of each. Everything you need – The school should include text books, models and up-to-date visuals for classroom instruction, and provide any other materials you need for on-water sessions in the sailing course you choose. Course variety – A good sailing school won’t just teach the basics. You should expect well-versed instructors and course options that include everything from recreational sailing and navigation to passage making and racing. The depth and breadth of a school’s expertise says a lot about its dedication to the sport. Well-maintained sailboats – Performance, stability, safety and fun are important parts of learning how to sail. Make sure the sailing school you choose regularly maintains its fleet and that its boats are properly outfitted. A comfortable, well-maintained sailboat ensures that your learning experience will be a successful one. A good student to instructor ratio – to avoid diluting the learning experience, there should be no more than four adult students per each instructor. A guarantee – Just like any other business, a sailing school should stand behind its product. Ask about the school’s policy for retaking courses that do not live up to your expectations. Good business practices – Never pay for a sailing course without asking about the school’s cancellation and refund policies. Last minute changes do come up, and knowing the rules about refunds and rescheduling will help keep you and the school from losing out in the investment. References – Before you choose a sailing school, see what its graduates have to say about their experience. If testimonials and reviews aren’t published online, call and ask for references. Offshore Sailing School meets and exceeds the qualifications above. If you have more questions about how to choose a sailing school contact us today!